Is Labour ready for another economic crisis? Ellie Mae O’Hagan writes that the Tories are politically prepared for another economic crisis, should one hit. Looking at the lack of profitable opportunities for capital presently, the ongoing investment strike, stock markets that went up and then came down, and the inflating credit bubble you’d be daft to rule one out with certainty over the coming years. Ellie talks about how she felt the left response to the crash(es) of 2008 were bland and complacent. My experience was different. I wrote at the time that there was a bit of energy and excitement about, even though we knew the government would strive to make a crisis of private capital into a question of public spending. For our part (I was a Socialist Party member up until early 2010) it was a spur for activity, of trying to raise questions about the crisis-ridden character of capitalism and get people to take our analysis seriously. Never mind that the SP’s theory of crisis was premised on the underconsumption of the working class, and therefore was both wrong and owed more to Keynes than Marx, and that it had confidently predicted 15 out of the last three recessions, we felt we were right and that our ideas had been vindicated after 30 years of neoliberal consensus. The Labour Party was intellectually paralysed by the crash. Credit where credit is due, Gordon Brown overcame his predilection for dithering and moved decisively to prevent the meltdown of Britain’s banking system. His rescue package became a model for elsewhere and helped stop the so-called ‘Great Recession’ from tipping over into an unwelcome retread of the Great Depression. But you got the sense this was all done rather reluctantly. Earlier in the year as Northern Rock courted liquidation, Alistair Darling appeared genuinely contrite that it had to be nationalised. And small wonder. As far as Labour under Blair and Brown had a political economy, it was one marked not just by market fundamentalism, but by the belief that it was the job of the state, as per Thatcher and Major before them, to create new opportunities for profit making and profit taking funded by the tax payer. None of this erases the positives of the last Labour government, but one cannot help noting these advances were tacked onto a core politics that, in all essentials, did not deviate from the script handed down from Thatcher to her successor. When the crisis erupted, Labour was not ready for it. It had a narrative, that the crisis was caused by the collapse of the US housing market and how exotic (and toxic) forms of debt were held by British banks which, in turn, placed them in danger of failure. It wasn’t our fault, guv. The problem was Labour had repeatedly told the City that it was fine and dandy, intensely relaxed some might say, with the financial alchemy driving the treasury tax take. With government seeing itself as facilitator of rather than regulator of economic activity, there was no position from which it could tell a story that exonerated its previous actions. It didn’t matter that the Tories under Dave were committed to the same spending plans and had attacked Blair and Brown for regulating too much – the only oppositions the popular media scrutinise come from the left. And so the future PM and chancellor articulated a position as per Ellie’s article, and we know what happened next. Are we in a better position today? One of the few positives to come from Labour’s loss back in 2010 is an opening up of debates around economics. Matters are a touch more heterodox now. Too late in the dying days of the Brown government, our beloved comrade Peter Mandelson talked about the need for the state to do industrial activism. Noted by his sometime admirer George Osborne, the Tories have talked a lot about this with their long-term economic plan and northern powerhouse nonsense, but it was only Labour that embedded it in their programme. Unfortunately, for a variety of reasons, the punters weren’t takers. Now? Well, the position has moved further to the left. Austerity is rightly attacked as unnecessary, harmful, and damaging from the perspective of capital as well as the people at the sharp end. The book is closed on neoliberal policy as even standard bearers of the Progress right swap Friedman and Hayek for Keynes, and we have closeted and not-so-closeted Marxists taking up advisory roles to Labour leadership. Despite these welcome changes, there is no indication this ferment is breaking news to people outside the strange little club of the politically interested and committed. We can talk about austerity and cuts, but the sad truth is it gets through to precious few. The Tories gambled that paring back public services and flogging off parts of the NHS without adversely affecting the majority of people, and their judgement has proven correct. Doubling down on criticising austerity isn’t going to work, and neither will exposes of cronyism and serious tax dodging. Unfortunately, I’m not in the possession of an answer either, and if I were change is made by movements of masses of people – ideas only gain flesh if they inhabit the thoughts and actions of millions. Perhaps, just perhaps, the ideas around the basic/citizen’s income could be the basis of a platform that will make people take note of what Labour is currently saying about the economy and the prospects of another crisis. Which is why, seeing as the economy clock could be counting down to a renewed round of ruination, it should be adopted as a matter of priority. Election should be about vision of new economic order – Is Labour ready? Global economic crisis: has Labour dodged a bullet? When will Labour start whacking Tories over their economic policy failures? Posted in: Economy, Investment, Labour, Macroeconomics, Politics. 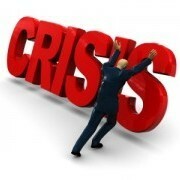 This isn’t a new economic crisis it is the same one. Nothing has changed, after the bailout, the banks kept on doing what they had been doing and the UK coverd it up with dodgy finance. By trying to claim this is something new or different, you play into the hands of those who claim the banks weren’t all at fault, that in any case they have reformed their ways and that the behviour of the UK govt and banks are somehow seprate when in reality the advisors in Downing St are still working in the banking sector. Bring back the real discussion, which is that what is happening now was orchestrated in the 1980s and was well reported then. The problem is still that the voting public don’t want to hear the truth of the disaster or face up to the radical socio economic transformation that is required. The same policies that Blair and subsequently Brown adopted then are still very much the core of the Labour Right. Since the problems that caused the failing of the banks still exist without change, the remedy cannot be sought without a completely new approach to the problems. The Tories have no intention of remedying the situation and likely the Labour Right will be obstructive, the answer, therefore, is to argue for change in the banking system and tax regulations as both these subjects do actually resonate with a great swathe of the public. Twenty million people in this country are living in poverty and most of them recognise that it is the government’s austerity policies that is the root cause. The discussions regarding austerity and it’s consequences are being heard and taken up. It really is about repeating the mantras of truth just as Tories repeat their mantras of lies. What works for one political party can also work for the other. Pretty good analysis Phil – we (as in Labour) don’t seem to have many answers to capitalism’s next crisis save for some technical stuff about Peoples QE, Keynesian investment. But none of that technical stuff is anywhere near to breaking through to working class voters, and that is the truth….maybe it is time for Labour to advocate socialism, and a genunely socialist economy, no less. No more advocacy of capitalism lite, or neoliberalism lite or rehashed social democracy as JC and John McDonnell describe…. we voted Corbyn because we got that Cooper, Burnham, Kendall had literally nothing to offer but more capitalism lite, and that old triangulation model was toxic, dead. Maybe now we are beginning to see that social democracy, Keynesianism, QE and all that are dead ducks and dead ends too ….perhaps it’s time for socialism? Under consumption `theory’ is the last refuge of the scoundrel. What on earth is the point of this article ? Other than to reveal Phil’s political despondency and neoliberal core politics ? In many previous articles, Phil B-C has ludicrously claimed that the Blairite Right are now “developing exciting post neoliberal economic ideas” . And now he completely bogusly claims the Blairites are leaning towards “Keynsianism”. Only if banker-enriching QE is seen as “Keynsianism, Phil. The fact is that the Labour right are still entirely entombed within the neoliberal, “shrink the state” and “privatise everything” narrative. They have nothing but slippery changes in terminology to offer . Phil knows this full well, but obviously despairs of any believable economic nostrums emerging from the ideologically bankrupt Right to tackle the looming next phase of the UK and global capitalist crisis. His one and only suggested “idea” for a policy offer is the laughably inadequate diversionary alternative to fighting on a mass, collective basis, for a comprehensive reinvigorated Welfare State – that old individualist chestnut of “Citizens Income” – borrowed by naïve radical bourgeois liberals like the Green Party from the Libertarian Far Right (and the dodgy , eccentric, 1930’s “Social Credit Movement”) – and totally discredited as a viable policy in the drubbing this core Green Party policy got during the General Election ! (And examined in detail and rejected by the Labour Movement in the 1930’s for all the correct reasons too). Far from there being no believable anti austerity strategy and radical Left economic restructuring policies available on the Labour Left – just have a closer look at the raft of radical Left Keynsian policies slowly emerging around the Corbyn Leadership campaign, Phil – including the proposals for People’s QE, as a source of funding for a major infrastructure programme to transform the Uk, of the likes of Tax Justice Campaigner , Richard Murphy – and you might actually discover that your pessimism about radical policy options to win mass support to oppose Austerity and rebuild the UK economy is wilful self deluding bunk. Why Phil regularly posts on here , masquerading as “of the Left” is a mystery. As a supporter of the Yvette Cooper Leadership bid, he is forever trapped in the Blairite neoliberal narrative – with nothing to offer but negativity and pessimism – and misguided enthusiasm for diversionary liberal nostrums like Basic/Citizens’s Income.. Nonetheless, I still enjoyed his largely accurate account of the crash and it’s circumstances, which did indeed have it’s roots in the US and the sub prime bubble compounded by lack of adequate state regulation and oversight, which has still not been rectified. In fact I felt it was a bit of a break from his usual role as ultimately another tired apologist for the abuses of American Capital and American capitalism, which is what the Neo Libral narrative basically boils down to. I generally agree with what John has said here, but I am increasingly frustrated that neither he nor any of the respondents to or authors of this and the next article on the ‘Big Short’ mention what I regard as the most obvious, and indeed urgent policy proposal, namely the breaking up of the big banks.The concentration of bank ownership in the UK is, along with France, the highest in the world on a per capita basis and poses an extreme threat to economic viability in the event of repeat of the situation in 2007-8.The banks are ‘too big to fail’ and would have to be bailed out again, although how and with what is not clear. The government has made it quite clear that it is not prepared to do anything to regulate or control the irresponsible and indeed in many respects criminal behaviour of its paymasters in the City.It is overtly a bankers government. Labour must expose this by demanding that the threat posed by the big banks is mitigated by their break up in favour of smaller regionally based banks as well as the agreed national investment bank. Such a policy, and the reasons for it, are relatively easy to comprehend., more so than QEor Keynesianism generally. I assume that JM will propose this at some point, but with the economic storm clouds gathering surely now is the time. Breaking things up is the bogus capitalist solution to monopoly. Our solution is to socialise property. We need to end the bail out of the bankrupt banks and take their deposits, staff and estates into administration to form out of them a publicly-owned People’s Bank that lends at base rate to small business and facilitates social investment in accordance with a democratic and sustainable plan. This bank must of course have a monopoly of credit to prevent private financiers from ever ripping us off again and bankrupting the country. Minus some of the ultraleft rhetoric and phrasing of David Ellis, I have to say that I am broadly in agreement. For that matter, John Penny has called for similar policies elsewhere on this forum. I am rather disappointed that Corbyn et al. haven’t been calling for this, although I appreciate that it’s probably because they feel it would be too radical to win mass support. Please find attached an invitation to an OBLG Business Networking Breakfast on Thursday 10th March, 8.00am to 9.30am. · Discover the individual elements that contribute to business success as Sharon De Mascia (International Speaker and Business Psychologist) introduces the underlying neuropsychology behind a Growth Mind-Set. · Discover how partnering with the Action Oldham Fund can build your company’s profile and reputation in the community. · Optional Tour of the new Oldham Leisure Centre (Middleton Road, Oldham, OL9 6AF) and the chance to win a 6 month premium membership. I wonder how many real jobs this bunch of loser will actually create and the answer is probably non at all, (for the rest of us,) for anyone outside their narrow parasitic state funded clique. That ain’t it. They don’t call for it because it is radical enough to win mass support. The left opportunists are even more scared of the masses in revolt than the ruling class. I entirely agree with you, Peter, on the absolute necessity to break the malign power of the big banks. I do not think a mere break-up alone into small regional banks , or on its own separating the “retail” from the “speculative/Investment banking functions is sufficient however. Indeed , a Left Labour Government seriously intent on a radical restructuring of the UK economy and steering our way through the deepening global Slump needs to plan to take the major ones into/back into, public ownership. Fortunately we are half way there with the likes of the RBS – those already partly in public ownership need to be fully nationalised to operate within the remit of a comprehensive radical Left National economic regeneration Plan . Unfortunately the Corbyn/McDonnell team seem to be rapidly retreating from this essential policy proposal. Why bother to set up a new “National Investment Bank” when we already could transform RBS (or a part thereof )into just such a bank ? (assuming Osborne hasn’t sold off the RBS shares for a pittance to his pals before 2020) . In my view John Mcdonnell is currently time-wastingly “fannying about” with too many Left (ish)”celebrity economists”, when he needs to get down to urgent detail economic planning with the help of fully committed Left economists and trades union research departments – before the Global various UK GDP supporting bubbles burst ,and Labour can be ready with a credible radical Left Keynsian Regeneration Plan to offer the electorate. I broadly agree with what John has said, although my point about breaking up the big banks was that this was now an urgent necessity in the light of the increasing likelihood of a banking collapse, and the failure of the Tories to do anything about because of their utter subservience to big finance.Labour should be making much more of this. On policy generally I think that McDonnell has done quite well in promoting an anti austerity agenda, and there’s nothing wrong in having the great and the good of the left Keynesians on your side, although Richard Murphy , the originator of much in this policy area, seems to have been squeezed out somewhat. I do agree however that it’s now time for something a little weightier. Yes, of course the banks should be publicly owned, as should the utilities, and RBS could become a new investment bank, but nationalisation costs money and we need a credible plan for achieving it. Peter I do not know whether you know about or understand money creation, but money is fundamentally issued as debt, the Bank of England does not have to issue it that way, and could issue it directly into the economy, the reason we don’t is purely a political decision. Should there be another crash, then it goes without saying drastic government action would be essential, the last Neo-Liberals (Brown and co) merely put the Bankers debt onto the “Deficit” and used it as an excuse to further dismantle the state. We on the other hand should be telling Jeremy and co to be bold, take the Banking system into public ownership as they will only repeat the same as before, and we the peasantry will eternally become the slaves of the banking system, which is of course where we are now. We don’t actually need an investment bank to issue money directly into the economy, the Bank of England could do that now. All it takes is the will of the government to do it. Note there is an excellent video at the bottom of this article which explains also that economics students in Universities are being taught bunk about how money is created. Even if you fail to react as negatively to the concept of a Basic Income as John Penny, I fail to see how it would be much help should another economic crisis hits. Even supposing the most optimistic outcomes of such a policy and viewing it as charitably as possible, at most it would pump a bit of money into the economy and prevent consumption from falling too much. Even that would only make it fairly unimaginative Keynesianism–hardly better than digging holes in the ground and filling them in again. Surely it would be better to invest in particular infrastructure and rebuild manufacturing? Although I don’t think it’s a policy worth pursuing, I’m not entirely hostile to the ideas behind a guaranteed income. However, you should argue for it on its own merits–not by claiming it will fix the economy. I really can’t imagine people seeing that in the Labour manifesto and therefore thinking “oh, what they’re saying about the reason for the economic crash makes sense–I trust them to do a better job than the Tories.” And that’s assuming that there isn’t any obvious fault in such a proposal, as there was in the Green’s manifesto last time around. From a member of a Trotskyist organisation to neo liberal apologist pretending to be a leftie. Blimey, that was a ride. I wonder which of the two positions were genuine? Enough of dramatic political shifts and on with two of the many criticisms I have of this post. “Credit where credits due” to Brown for saving the banking system. Oh, and as a by product opened the door for two of the most draconian cost cutting governments in history having portrayed labour as economically illiterate and apparently unelectable into the bargain. Who was the chancellor who allowed the banking sector to get us into this mess? Thanks Gordon for all of the checks and balances on the sector you forgot to introduce. Then to the left being lost at the time. Were you not on that huge TU demonstration back at the beginning of the condem government Phil? You must remember, the one that took hours to get to Hyde Park and Bob Crow called for a general strike? It wasn’t the left that had lost its way Phil, it was the right, who at the time had a stranglehold on the labour and trade union movement and ignored the potential of that movement because they had bought into the austerity agenda. But that doesn’t fit in to your make believe leftie perspective does it Phil, especially when there is a left to undermine whilst you pretend to be one of us. With friends like you man. “I am grateful to many of you here tonight, including the Lord Mayor, who has agreed to serve on the new City advisory group. Ed Balls, our new City Minister, will work with you to develop publish and then promote a long term strategy for the development of London’s financial services and promoting our unique advantages and assets. We will set a clear ambition to make Britain the location of choice for headquarters and services, including R&D, for even more of the world’s leading companies. And just as two years ago we promoted the action plan for liberalising financial services across Europe, I can tell you that the Treasury is now working with Charles McCreevy and with you to ensure that the forthcoming European financial services white paper signals a new wave of liberalisation. As we can see Ed Balls was in together as well and so when Ed Miliband made him his Shadow Chancellor, it was clear that Ed Miliband was a Neo-Liberal that planned as the others before him to carry on, spinning as he went, only he didn’t fool the electorate either. I endorse all that John Penny said, there are still Neo-Liberal tendencies in the party that think they can spin their way through politics, this article is a veiled attack on the left not a credible political strategy for moving forward. We can regain the political advantage by highlighting that New-Labour were not Labour and there is an absolute necessity to ditch all their Neo-Liberal policies. The two key facts that need to be argued within the party and country at large, is that we can afford our public services and that we need to rebuild our infrastructure and manufacturing base, in order to create a viable economy. We should turn our backs on the Casino economy and in my view nationalise the banks as well as all the others. Money is printed out of thin air, money is not a problem for us, poverty is a political choice, not a fact of life. I’m also a bit confused by, “I was a Socialist Party member up until early 2010 ?” I tend to assume that you probably mean a member of the Labor party; whom few people that I know have really regarded as socialist, (although the still try to maintain that pious fiction,) the “traditional,” (the school of; I’ve been a member of the Labor party man and boy, blindly and uncritically,) few people, (that I know,) see Labor as really being socialist now, not in any useful or meaningful sense, not for at least 2 decades, (at least since, “The Great Charlatan,” embraced the Thatcher abuses rather than revoking them,) and particularly after the loathsome rhetoric about the disabled and the unemployed from all the horrible little closest Tories like Reeves, Burnham and Kendell etc, during the election. The Labor party, to many people, often looks like little more than the compliant and increasingly redundant adjunct to the Tories that it became under Blair. No J. P. Craig-Weston, Phil B-C, does NOT mean he was a member of the Labour Party up until 2010. Astonishingly he was apparently a member of the orthodox Trotskyist Party formerly known popularly as the entryist Militant Tendancy ! Socialist Party of England and Wales” aka “SPEW”), to his current ” Yvette Cooper as Labour Leader” supporting, and repeatedly stated admiration of the bogus “new policy development advances” of the Blairites like Liam Byrne, is surprising to say the least ! I don’t think Phil’s views can really be your cup of tea, J.P. Craig-Weston ?